appears to kill Elendil, the High King of Arnor and Gondor, and Gil-galad, High King of the Noldor. Just afterward, Isildur grabs his father's broken sword Narsil, and slashes at Sauron's hand. The stroke cuts off Sauron's fingers, separating him from the Ring and vanquishing his army. However, because Sauron's life is bound in the Ring, he is not completely defeated until the Ring itself is destroyed. Isildur takes the Ring and succumbs to its temptation, refusing to destroy it, but he is later ambushed and killed by orcs and the Ring is lost in the river into which Isildur fell. birthday, Bilbo leaves the Ring to his nephew and adopted heir Frodo Baggins. The Wizard Gandalf soon learns it is the One Ring, and sends him to Bree with Sam, with plans to meet him there after Gandalf goes to Isengard to meet the head of his order, Saruman. Saruman reveals that the Nazgûl, or Ringwraiths, have left Mordor to capture the Ring and kill whoever carries it; having already turned to Sauron's cause, he then imprisons Gandalf atop Orthanc. Frodo and Sam are soon joined by fellow hobbits Merry and Pippin. After encountering a Ringwraith on the road, they manage to reach Bree, and there they meet a Man called Strider, who agrees to lead them to Rivendell. They agree only because Gandalf isn't there to guide them. After some travelling, they spend the night on the hill of Weathertop, where they are attacked by the Nazgûl at night. Strider fights off the Ringwraiths, but Frodo is grievously wounded with a morgul blade, and they must quickly get him to Rivendell for healing. While chased by the Nazgûl, Frodo is taken by the elf Arwen to the elvish haven of Rivendell, and healed by her father, Elrond. pass the mountain Caradhras, but they are stopped by Saruman's wizardry. They are forced to travel under the mountain through the Mines of Moria. After journeying partway through the Mines, Pippin accidentally gives away their presence to a band of orcs. The Fellowship then encounter a Balrog, an ancient demon of fire and shadow, at the Bridge of Khazad-dûm. Gandalf confronts the Balrog on the bridge, allowing the others to escape the mines, while he falls with the creature into the abyss below. Gimli find Boromir, who regrets attempting to steal the Ring and dies. 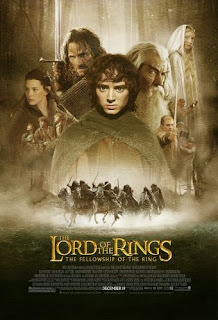 They decide to pursue the orcs and rescue the hobbits, leaving Frodo to his fate. Sam joins Frodo before he leaves, and together the two head to Mordor.